The robots are coming! And they're here to stay. Robots are appearing in all walks of life, from building products in factories, to mowing your lawn. Our robotics Design, Build, Automate week brings 3 of our robotics courses into one week of focussed creation and learning. Start out in this fascinating field by building and programming your own remote controlled robot. Then make the robot drive itself by following a line and avoiding obstacles! Design, test and tweak algorithms to optimise your robot. Then compete against the rest of the class in our competition at the end of the week! This course does not use a "kit" but builds the robot from component parts and direct programming of controllers. This course is an ideal introduction for those looking to explore robotics for fun or as a career. A quick overview of the programming concepts we will need for the course. We will examine a robot like the one you will build to understand the component parts. This small, cheap computer will be the brains of the robot. We will turn it on and play with it. We will attach a controller board to the Pi and use Python code to control motors, sensors and lights. 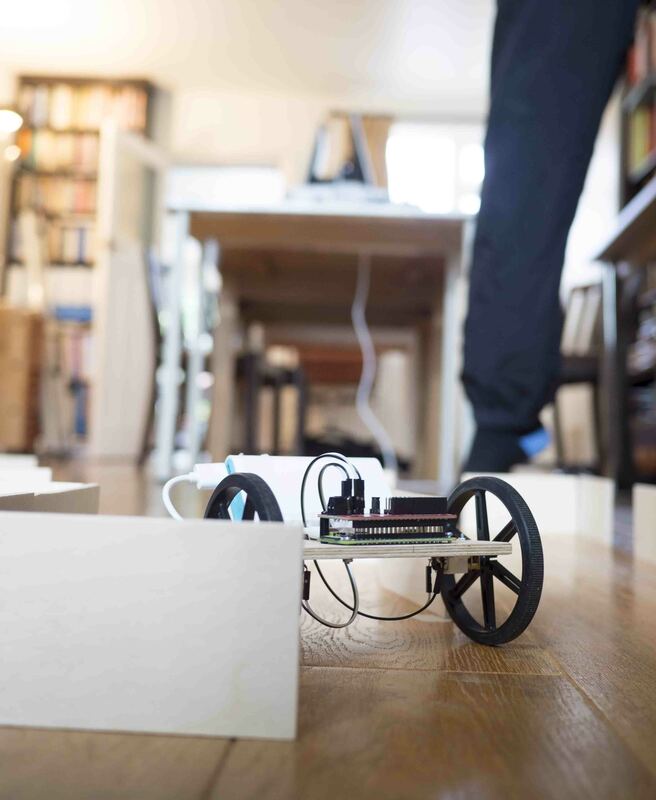 Learn how to connect and code a remote control and write more Python code to make the robot respond to user commands. We will take a look at the physical principles, design the robot and assemble it. 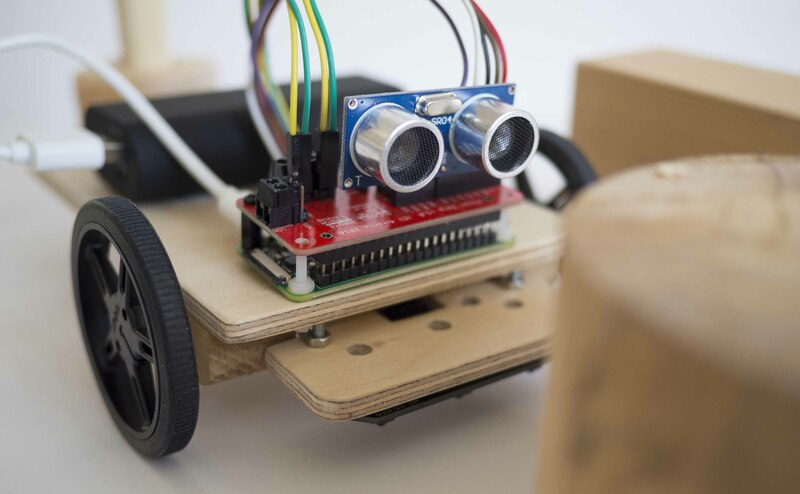 The robot will be cut from plywood to your design specification. We will code the robot to respond to commands, including moving forward, backwards, turning, spinning and stopping. Students will be encouraged to use a computational problem solving approach. Attach a line-following sensor and develop some code and algorithms to guide the robot along the line. 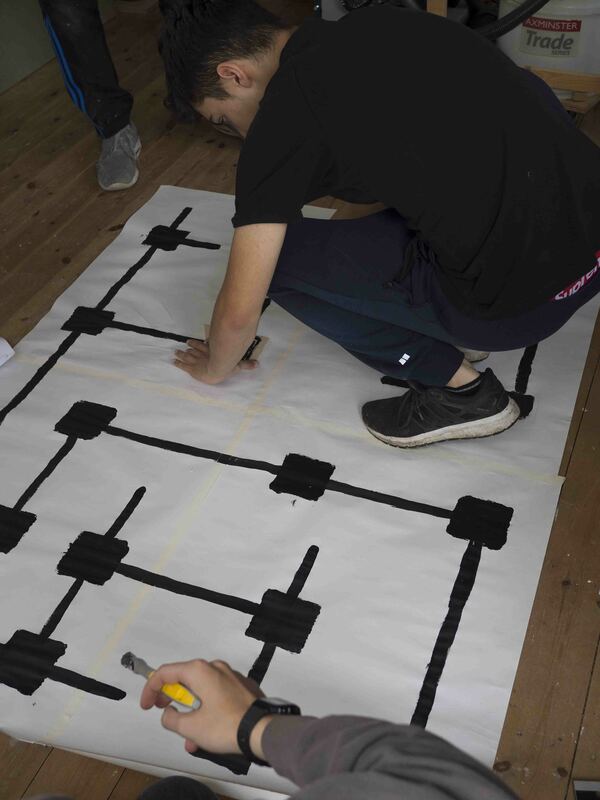 Attach an ultrasonics sensor and develop some code and algorithms to help the robot navigate around the room without human intervention! Make any changes and test the robot. Compete against other student's robots (and Floella, the house robot) in 3 challenges! Prices above are for tuition only. If you want to take your robot/computer away with you, components will be charged at cost price and will be in the region of £65 per robot. Explain the overall workings of a simple remote controlled robot. Explain the mechanisms involved in using light sensors for robot navigation. Explain the mechanisms involved in using ultrasonic sensors for robot navigation. Describe the physical design principles for a wheeled robot. Analyse computational problems using modelling techniques. Write Python code to implement robotic behaviours.